Most amateur astronomers have seen Mars. A moderately sized telescope can show a bit of detail. 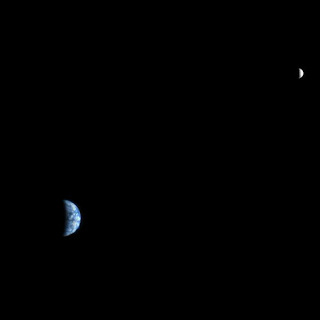 Have you ever wondered, however, what Earth would look like from Mars? Kind of like this.. This image was taken by NASA's Mars Reconnaissance Orbiter on October 3, 2007. Image Courtesy of NASA/JPL-Caltech/University of Arizona. I love pictures of the Earth from space; it as close as a 63 yr old will get to space flight. The moon at the top right of the image is our own moon, Luna. Great picture, views like that always drive home how small our corner of the universe really is. Frankly I feel rotten at this moment so as to benefit from everyday materials amazing report without this web site. These days check this Cash Advance Kudos meant for fine material.